This past Saturday evening, the Fullerton Arborteum hosted their 2014 Fullerton Uncorked, a festival celebrating local food and wine. This tasting event brought out many of the local restaurants, wineries, and breweries to sample their goods to everyone in attendance. The $65 admission fee provided full access to all booths, allowing attendees to eat and drink as much as they could until the vendors ran out. The format followed that of another similar event that takes place here, Blues Brews N’ BBQ. Unlike that event, Uncorked had many more participating vendors, and covered more area of the Arboretum as a result. Attendance also appeared significantly higher than the aforementioned event, as not only did many of the vendors run out of product before the event came close to ending, but you seriously had to elbow your way through the crowds to get anywhere. As one of the greater draws of Uncorked, attendees could sample as much of the food and drinks as they possibly could until the vendors ran out. Though many of the vendors ran out of food or drinks within a few hours into the event, a sole person could get full after visiting a handful of booths, as the vendors served hefty tastings. Sure they look small, but these hearty samples filled a person up quickly. Most of the wine vendors remained in place throughout the night, though I cannot say the same about the beer vendors, who all tapped out within two hours into the event. Perhaps the preference for craft beer has significantly increased since last year’s Uncorked! To put things into perspective, last year Hangar 24 finished one keg within two hours. This year, they ran through two kegs within 80 minutes. Considering that all beer vendors ran out in under two hours, and the wine remained pouring all night, this indicates one of two possible outcomes: that the majority of the attendees truly sought craft beer as opposed to wine, or that all the beer vendors simply did not bring enough for the party. Considering that Uncorked invited only the truly established breweries to this party who all know how to operate a tasting event, I would deny the latter claim. Considering that I attended this annual event for the first time this past weekend, I held zero expectations for this event coming into this weekend. The amount of attendees showed that the organizers underestimated the amount of food and drinks required to keep the event going the entire time. I mean, a vendor that originally served sliders ended up served the meat over a bed of greens since they ran out of buns (last photo). Also consider that all the beer ran out within two hours out of a four-hour event. I hope the organizers take a good look at their attendance numbers and redesign the event based on that for next year’s Uncorked. Interested in more events like this? The Arboretum routinely holds food and/or beverage events like Uncorked, so Like their Facebook page for updates regarding upcoming events. Against Me! will headline a small show tonight at The O in Santa Ana. Tickets to this all-ages show cost $25. Arrive early enough to park at The O’s parking lot for free. Arrive too late, and end up parking in a lot down the street for $10. Legendary punk band Reagan Youth ends their national tour this week in Southern California, complete with four headlining shows. Ticket prices and age restrictions vary with the show, so click on each link for individual details. Enjoy a five-course dinner complete with craft beer pairings courtesy of Stone Brewing this Wednesday night at Parker’s Lighthouse in Long Beach. This dinner costs $65 per person plus gratuity, and nobody under 21 may participate in this dinner. Reel Big Fish will headline a ska show in Riverside this Thursday night. Tickets to this all-ages show cost $29. Legendary UK punk band Sham 69 will headline various shows in Southern California this week. Each show had different ticket prices and age minimums, so check each link for more information. Bring the family out to this all-ages city fair this weekend. Free to attend, this fair has everything that a family can enjoy, from the rides and games for kids, to the entertainment and vendors for adults. Remember to check out all the fair food, drinks, and dessert too, since buying food here supports local organizations and businesses. On Sunday afternoon, the park will host a small beer fest with some local breweries. Guests interested in the beer fest can purchase five tasters for $12, or ten tasters for $20. Guests can find free street parking in the surrounding neighborhoods. Enjoy a night in Downtown LA without the fuss of overpriced parking and overpriced food & drinks. Gain all-night parking for just $5, and enjoy $5 specials from local restaurants and bars. Just a week prior to the actual Taste of North Park, the organizers will host a free and all-ages movie screening this Friday night in North Park. In addition to the movie, visitors will find a beer garden, local food booths, a live DJ, a craft cocktail competition, and more. Enjoy family-friendly fun this Saturday at the Walnut Tree Festival in Whittier. Free to attend, participate in a walnut cookie baking contest, or check out all the art, shopping, food trucks, and more. At this scavenger hunt of sorts, participants will scour East Long Beach for certain businesses that hold prizes and/or raffle tickets to win bigger prizes. Participation for this scavenger hunt costs $15. This Saturday, Hangar 24 will release two beers on the same day. As they do every year, their pumpkin porter Gourdgeous comes out starting this Saturday. In addition, check out the latest addition to the roster, Falling Leaf, their Gourdgeous aged in bourbon barrels. Visitors to the tasting room can sip on Falling Leaf from draft, as well as take bottles home for $20 each. Throughout the day, visitors can enjoy live music, as well as food from the local mobile eatery. A first time exists for everything, right? If you love Oktoberfest but follow the vegan plan, then you will fit right in at this one-of-a-kind Oktoberfest. All the typical Oktoberfest festivities will keep everyone occupied, while everyone gets full on vegan food and vegan beer. General admission costs $45, starts at 1pm, and includes one stein glass with unlimited beer pours. VIP admission costs $65, starts at 12pm, and also provides access to a VIP area with food samples. Following the massive success of last year’s event, the San Diego Night Market returns to a new location in Kearny Mesa this Saturday evening. Deriving from Asian cultures, this night market brings a taste of Asian nightlife to the streets of San Diego with Asian food, culture, live entertainment, arts & crafts, vendors, and more. Admission only costs $2 for adults, while children can enter for free! Please refer to the website for details regarding free parking and shuttles. The first ever World Foodie Fair came to Culver City this past Saturday evening. At this all-ages tasting event, ten hopeful restauranteurs all served their cuisine that would represent the menu of their dream restaurant. All ten participants do not currently own a restaurant, but want to use this pop-up event to test the waters and get a feel for the experience of running a full business. Each $6 ticket provided $7 worth of food, and attendees voted for their favorite foods at the end of the event. Four one-hour sessions took place starting at 5pm in order to spread out the flow of attendees, and interested attendees could purchase tickets for this event ONLY online so that the organizers could cap each session due to capacity limits. For a first-time event, I expected some hiccups along the way. As the most glaring issue that affected everybody, the organizers did not open the doors to the public until 6pm, an hour later. Everyone involved in this project simply underestimated the amount of time it took to get everything ready. I will not speak much on this, as all attendees that had to wait an hour all openly voiced their discontent. Another issue involved the spacing, as this took place at a small cafe that could comfortably hold no more than 50 guests at a time. The organizers attempted to circumvent this by capping the amount of tickets sold per hourly session. One problem that troubled me and a handful of other attendees revolved around the ticket costs. Since nobody could use one ticket anywhere, many attendees ended up with one ticket and ended up losing that ticket because they did not want to pay for another batch of tickets. Aside from these problems, the only other real problems lie in the quality of the food, which I will now cover. I wanted to taste more duck in these tamales. The curry sauce drowned out the duck flavor. If they can tone down the curry sauce, it would help to highlight the duck, a meat not often used in tamales. This spring roll contained nothing unique. It tasted just like any other spring roll. Although this took the longest to wait for due to the long line, I liked this the most. Of course, frying anything will make it taste better. I really did not enjoy the sausage with its rubbery casing that I could not bite through. The bread also made it very dry. On paper, this sounds delicious. The thinly-sliced pork belly quickly gets drowned in everything else on top of it. Honestly I dug straight in to the meat, as I expected that everything else would mask the flavor of the beef. They did not lie – they braised this beef to the point that it melts in your mouth. It tasted like normal spam musubi to me. I craved more of the seaweed-essence present in spam musubi elsewhere. Finally, dessert. The truffles contained dark chocolate, which caused a strong lingering aftertaste. I loved the fruit pâté so much that I took a bag home. Honestly, I wanted to take all the bags home. It only consists of puréed fruits and sugar, but it tastes like bliss. Nothing special to see here folks – just eclairs with a cream filling topped with chocolate and chocolate crisps. Basically, the comp’d item for making the 5pm attendees wait an hour. Some of these tasted overly sweet, but eat just one, and it will taste just fine. Although they did end up starting an hour later, I still think the organizers did all in their power to ensure that this event would run smoothly. They certainly have an ambitious goal in helping these restauranteurs get moving towards their dreams. In recent years, anyone wanting to get into the restaurant business would typically look to open a food truck to test the market. Pop-up tastings like this have gone on for many years, but since they only occur sporadically, people rarely hear about them, as opposed to food trucks that persist even after a dinner shift ends. Would you like to attend a pop-up tasting event like this? Check on my blog every Monday for a list of the week’s upcoming events, as I plan to stay in touch with the organizers of the World Foodie Fair. The 2014 Long Beach Comic Con returns to the Long Beach Convention Center this upcoming weekend. This two-day all-ages expo of comics, video games, anime, manga, and toys brings together fans, artists, designers, and more from around the world to meet with like minds and share interests. With plenty of speakers and workshops, the expo ensures that any attendee would find something to stay occupied. This year’s convention will not feature the Horror theme that it had two years ago, and will focus solely on the comics aspect of it all. Click here for a FULL schedule of all of this weekend’s activities. The convention runs on both Saturday and Sunday this weekend, starting at 10am, and ending at 7pm on Saturday, or 5pm on Sunday. Purchase your admission by 5pm this Friday to gain access to the convention an hour earlier, starting at 9am on both days. Presale admission costs $30 to attend on Saturday, $20 to attend on Sunday, or $45 for the entire weekend. Admission passes at the door will cost $5 extra. Parking at the convention center costs $10 per vehicle. Those looking for free parking will not find much in Downtown Long Beach, so either park in the neighborhood east of Alamitos Ave, or take public transportation from elsewhere. This expo takes place mainly indoors, so most visitors will not have to worry about sunlight or excess heat; however, anyone intending to remain outside for prolonged periods for photographs should apply sunscreen just in case. 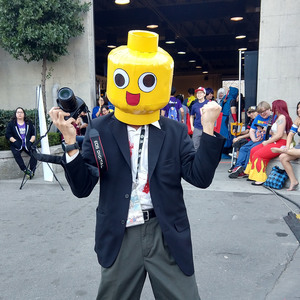 Remember that the Long Beach Comic Con occurs twice a year, so if you cannot attend the San Diego Comic Con, Long Beach also has a great turnout. Never underestimate an event similar to a big one, as Long Beach proves each year that the people truly love this expo. The 2014 Cerritos Taste of the Region & Business Expo returned to the Cerritos Center for the Performing Arts last Thursday night. Open to all ages, this food fest, colloquially known as the Taste of Cerritos, allows all attendees to sample food, drinks, and dessert from various restaurants from the Cerritos region. Participating restaurants and caterers, which contained more corporate businesses than local businesses, hailed from neighboring cities such as Artesia, Norwalk, and Whittier. At first, this sounds less likely of a taste of the region if attendees mostly sample food from restaurants found nationwide. However, this event focuses on all businesses in the area, corporate or not. Times change, and sometimes times change for the worse. Last year, the tasting event cost only $5 to enter, and boasted an equal share of food vendors and business vendors. This year, the organizers doubled the price to enter the event, claiming to have double the features. Sure the Taste of the Region allows attendees to eat & drink all they want until the participating businesses run out of food or drinks, but now that admission has gone up to $10, I expect to find twice as much food as last year. Sadly, the amount of food remained the same as last year, but the amount of non-food vendors increased. It appears that with each year, they shift more towards the business expo while shifting away from the restaurants, and I even stated last year that the ratio of non-food vendors to food vendors would increase. Sooner or later, they may scrap the tasting altogether, god forbid, and focus solely on the business expo! Downtown Long Beach‘s series of tasting events moved down to the waterfront for an evening of sampling eats on the pier last week. The Taste of Downtown Long Beach invites many of area’s restaurants, bars, and other food businesses to come together to serve samples to all visitors looking to explore what Downtown Long Beach has to offer. Due to Long Beach’s structure of regional neighborhoods, a sole Taste of Long Beach would require too much work, and would come up to a loss rather than profit. With Belmont Shore running theirs in the summer, and Naples Island running theirs once a year, Downtown Long Beach runs their series of tasting events approximately three-four times per year, each in a different location. Participating businesses remain largely consistent between each event, with a few changes to accommodate for new businesses and others that could not or did not want to return. With each event, the location moves around from place to place within Downtown Long Beach, from the East Village Arts District to the bustling Pine Avenue on a busy weeknight. Last week, the taste moved down to Rainbow Harbor for an evening of feasting on the pier. Unlike previous Tastes of Downtown Long Beach, this one did not feature as many participants. In fact, this one contained the fewest amount of participants out of all the events of the year. Many of the standard businesses made an appearance, while some others could not bring a setup out to the pier, such as Federal Bar or Beachwood BBQ. Visitors to this Taste of Downtown Long Beach could receive 90 minutes of free parking at The Pike’s parking structure. However, the website only mentioned this once, and very few of the visitors knew about this, and either resorted to paying for parking or took some other means to arriving that usually associated a cost or physical effort. I find this the fault of both sides – the website did not make parking an important point, and visitors must not have read the website thoroughly. Regardless, all visitors enjoyed tasting these fine eats out on the waterfront, despite the weather warmer than usual. Things will cool down by the next Taste of Downtown Long Beach which should occur in the winter. The annual Belmont Shore Stroll & Savor of Long Beach concluded just last night. This “Taste of Belmont Shore” occurs every year from May through September on the third Wednesday, and the Thursday immediately following. Guests may purchase booklets containing 12 tickets that get redeemed at participating businesses along 2nd Street in Belmont Shore. The products offered by participating businesses range from appetizers to drinks to desserts to even full plates of food. Ticket prices vary based on the location, with some offering more than the value of the tickets, and many offering less than the value of the tickets. The chance to sample what Belmont Shore has to offer makes the value of the tickets negligible, seeing that Belmont Shore does have amazing eats. Domenico’s has remained one of the few historical restaurants of Belmont Shore, and for good reason. One bite into their signature Ground Pepperoni Pizza will hook you in. Just take care not to over-indulge – each slice basically contains a day’s worth of sodium. Pandor Bakery participated for the first time this year. They served these rather dry pastries which definitely does not represent what they actually sell inside their shop. Known for their Danish-style ice cream, Paradis always delights visitors, especially on hot days. They always have a cooler outside where they serve four or five of their popular flavors during Stroll & Savor. Locally popular dive bar Acapulco Inn (A.I.) occasionally participates in Stroll & Savor, usually serving small bar food bites that does not appear on their menu, such as a Corned Beef Slider or Al Pastor Taco. Belmont Shore newcomer Pho-Nomenon started participating in Stroll & Savor this year, offering a variety of “safe” options to visitors. For example, they have Frog Legs available, but did not have it available for Stroll & Savor. Due to the extreme heat, I had to hydrate myself with an iced tea from the local Starbucks, who also participates in Stroll & Savor. Rocky Mountain Chocolate Factory sometimes has a Stroll & Savor menu up, but rarely makes any spectacle about it to drive visitors in to try their goods. Rather, RMCF focuses on actual sales instead of Stroll & Savor items. Sweet Jill’s remains a favorite during Stroll & Savor because of their full-sized items that cost just three tickets. That said, they participate nearly every single time and offer almost the exact same things each time. La Creperie Café participates once in a blue moon, and when they do, they stick with a safe option. For example, they served one of their standard items from previous Stroll & Savor years – their Chicken Carbonara Crepe. If Yen Sushi feels like opening a stand for Stroll & Savor, they use the exact same list of offerings each time. Nick’s On 2nd always serves up something new with every Stroll & Savor. From the Hickory Burger to the Prime Rib Dip Sandwich to the Breakfast Burrito, for only three tickets each, Nick’s delivered a standout tasting each time. Frosted Cupcakery typically serves the same two items: Mini Cupcakes and Hi-Tops, or inverse cupcakes. Each time, they switch up the flavors of either the cake or the frosting. Each unit costs one ticket, making for a great closer to the evening. La Strada participates in every Stroll & Savor as one of the foundation restaurants of the event. New visitors definitely should check them out. However, as they never change their offerings at all, returning visitors will have already seen what they have to offer. Although Thai Gourmet By Sri Maya represents one of multiple Thai restaurants in Belmont Shore, they do nothing different for Thai cuisine. When you come here, you will get exactly a Thai restaurant and nothing different. Newcomer Gallo’s Italian Deli participated in their first-ever Stroll & Savor this year, serving up traditional deli-style sandwiches. Tavern On 2 has generated tons of momentum this year, especially after their airing of Diners, Drive-Ins, & Dives. In regards to Stroll & Savor, they only participated in the first month, then went dark from that point on. They cited that Stroll & Savor does not reel in new customers, and requires more resources to participate than the event would cover for, not to mention that the food sample does not even appear on their menu. 2nd Street newcomer Eat Shabu whipped out something different this year: ice cream freshly churned on the spot with liquid nitrogen. I seem to see a lot of this around lately. Perhaps this will turn into some sort of hipster trend? One of my personal favorite ways to end a Stroll & Savor evening, Powell’s Sweet Shoppe serves their classic mini cones that only cost one ticket. Flavors vary each time, and range from ice cream to sorbet to gelato. New Japanese restaurant Sushi AI started participating in Stroll & Savor this year, and they do it right by offering new items each time, such as their Popcorn Lobster. One of the other major Thai restaurants of Belmont Shore, Phuket Thai, generally keeps things the same every time Stroll & Savor comes around. They do participate in every single one, and never appear to change the offerings, albeit they have to rewrite the menu each time. Last but not least, perhaps the most famous of all restaurants during Stroll & Savor, George’s Greek Cafe brings forward the greatest value of Stroll & Savor – a full meal on a plate for just four tickets. This plate contains hummus, tzatziki, pita bread, salad, spanakopita, and gyro meat. No one else on 2nd Street offers so much food for so little tickets, and everyone else agrees. The line for George’s Greek Cafe typically wraps around the corner past Dog’s Bar, so if you have never tried this plate, I urge you to visit George’s early while the line has not had a chance to stretch out far. Besides all the food & drinks, as an event that attracts thousands of visitors, local music acts would not pass up the chance to perform for tips during Stroll & Savor. Do not miss out your chance to taste the best of local flavor in Long Beach! If you missed Stroll & Savor, keep in mind that it occurs five times a year from May through September. Even if you cannot wait for Stroll & Savor to return, head on down to Belmont Shore anyways and dine at any place that piques your interest! After MUCH anticipation from craft beer fans throughout Southern California, Dudes’ Brewing in Torrance finally opened their doors to the public this past weekend. For over a year, Dudes’ Brewing has graced Southern California with their presence at multiple beer festivals, such as Bock Fest or Drink Good Beer Fest. Most, if not all, people who have encountered Dudes’ Brewing will recall the Grandma’s Pecan and/or the Kölschtal Eddy beers, as these two essentially represent the flagship beers of Dudes’ Brewing. With the opening of their doors this past weekend, Dudes’ Brewing marks yet another entry into the South Bay craft beer scene. Their tasting room has just what it needs to feel homely for any dude or dudette entering the premises. An open space gives way to some tables, a wall ledge between the front door and the garage door, two televisions, Lebowski stickers & references everywhere, and of course the bar when the beertenders serve up their brews. The rest of the tasting room gives way to the production area, which not only includes their canning line, but the five tanks bearing the letters in the word DUDES’. For the grand opening, Dudes’ Brewing did not celebrate alone. Pretzel Crisps and Tribe Hummus brought free samples for all guests to snack on. Food trucks also showed up right outside to serve up hot food to any hungry guest that needed more sustenance than just pretzel snacks. For as long as they have brewed beer, one would expect them to have a full grasp on the grand opening of a tasting room. Unfortunately, some issues did arise right from the start. Perhaps what irked guests the most involved the beer servings. Not only did Dudes’ Brewing not fill growlers, but they did not have beer flights available, only opting to serve pints or half pints. Although Dudes’ Brewing originally advertised 13 taps, they started off with only nine brews available. Not only that, but their credit card swiping device did not function at the start, so they remained on a cash-only basis for quite some time. To make matters worse, the city police department set up checkpoints on both sides of Western Avenue early on Friday evening. Although I wanted to stick around longer to try more of the brews, I knew that lingering would get me into trouble, so I left before anything bad could go down. Regardless of the rocky first weekend, Dudes’ Brewing had already stomped their foot down on the Southern California craft beer scene, and the opening of their tasting room only solidifies their position as a stronghold. Keep up with the happenings at Dudes’ Brewing by liking them on Facebook and following them on Twitter. Let me know in the comments section below what you think about Dudes’ Brewing if you attended the grand opening weekend, or after you have visited the tasting room.